Awkward Me..: "See The Reaching"
Isn’t it great once you have tasted the fruits of your labor? In my 4 years of stay in this Royal and Pontifical University, I must admit that it was never an easy job. Dealing with terror professors, some “bipolar” block mates, nerve-wracking subjects, deadliest deadlines that are almost impossible to beat were never a laid-back tasks. It requires a lot of patience, hardwork, brains, and passion. But on the other side of the coin, there were a lot of good and happy moments within my 4 years of stay. I met a lot of people who became my friends. I learned new things from the people and the environment around me. I even learned how to be “normal”. I became the girl who goes to parties and has nightlives, who drinks during occasions, who procrastinate even during exam weeks, who join boycott plans by the class though sometimes I am the one who suggests it. But even though I live like an easy-going type of person, I still know my priorities. I still know what’s my purpose in staying in this big city, being apart from my family and spending most of the time with different people with different walks of life. Maybe that’s the reason why I was able to achieve something. Aside from I let God do His will, I made sure that I work and put effort to achieve everything I want to have. I believe that this was God’s way of telling me that I did great and that I deserve to receive all these blessings. Anyway, since I’ve been mentioning “achievements” and stuffs (which is actually the topic of this post), let’s go to the main course. 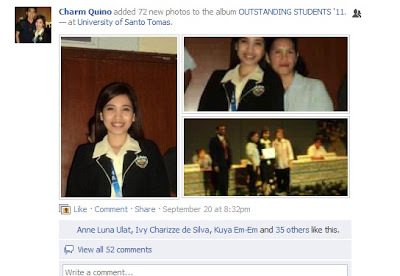 I was awarded as one of the most outstanding students of 2011. Actually, every year I had been receiving this kind of award but this time, it’s a bit different. I felt very special. My boyfriend also attended. It was his first time to attend my recognition day and he showed me how proud he was. I appreciate his willingness to stay up to 5pm considering that he had a review class in the morning. It was indeed a tiring day for him but still, he wanted to make me feel that he also supports me. Even my friends congratulated me, it’s as if I already graduated college. Look, they liked my album on facebook. Teehee. Congratulations!!! woohooo! Mas astig pa sayo mama mo, tignan mo naman ang porma, tindig at pose - waley ka! hahahaha! You deserve everything and I know your Mama and Papa are so proud of you. Of course, I'll be there :) It's a privilege for me. Just let me know when.